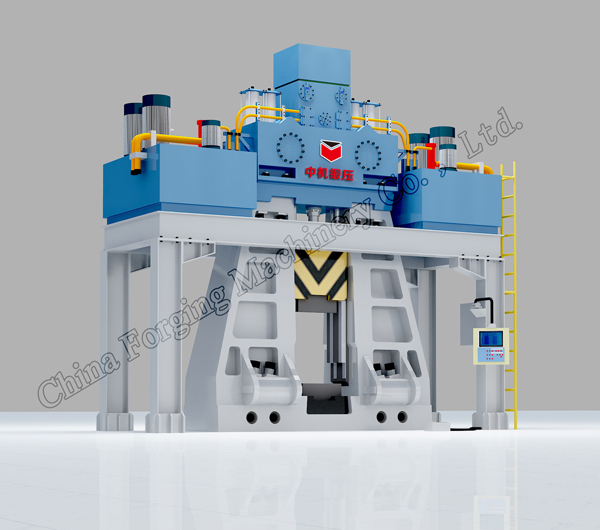 Its appearance is same as CT88K PLC fully hydraulic die forging hammer. Its driving system is fully hydraulic driving system designed and made by CFM, fixed on columns with elasticity anti-vibration cushion block. This system uses advanced taper valve control technology, combine cylinder transit technology, double anti-leakage and hydraulic integrating technology, simple system structure. And Key hydraulic components and seals are imported. Its striking system use separated hammer body structure, using old pneumatic hammer columns and anvil to modify, and columns are connected to anvil by bolts. Its guiding is using the steel X-shape guide rails fixed on the columns by bolts. 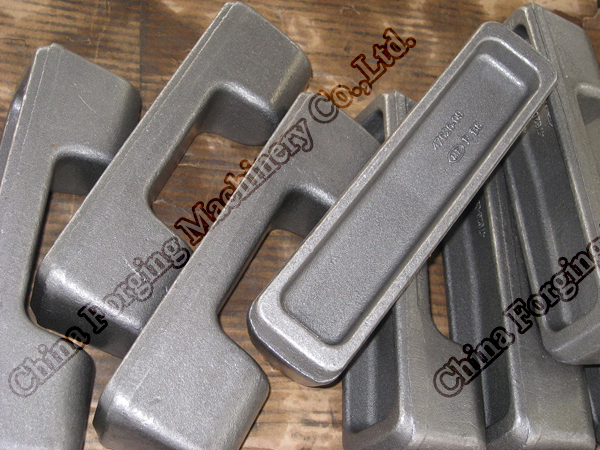 Extending line of contacting surface of guide rails and ram crosses on the ram center, which cannot effect guide clearance due to heating, and clearance between ram and guide rails can be adjusted to be small to assure die matching. Radial X-shape wide guide structure make sure ram guiding clearance will be not changed due to heating. And this guide rails lubrication is automatic and exclusive, whose lubrication oil volume can be preset by operator according to machine requirement, and its level can be monitored. Once there is problem on lubrication system or level too lower, there will be alarm on touch screen and this system buzzer with alarm. Conversion of existing steam (air) the die forging hammer with fully hydraulic driving system is with very obvious economic effect and much cheaper than a new fully hydraulic die forging hammer. If the pump house was not considered, the hydra-pneumatic hammer may be cheaper than the fully hydraulic hammer. But in fact if the pump house and the piping system should be calculated together, the steam die hammer conversion will almost be equal. If maintaining cost is considered again, the pneumatic die hammer numerical control transformation l cost will be lower. Striking program is easy to input, no need skilled computer engineer, and even semi-skilled worker is OK. When hammer working, control system can check oil temperature, pressure, cleanness and position and then numerical display. Once problem, the malfunction alarm light will be on and the malfunction position and character will be on touch screen. Special designed die automatic lubrication, blank convey system, ejector and scale removing system are for customer to choose. They can be linked to hammer through program to realize die lubrication locating, timing, quantifying control, to improve its productivity and reduce labor intensity.